The word "xeriscape" is derived from the Greek word "xeros," meaning dry, and "scape," a type of view or scene. Xeriscaping is currently defined as a method of landscaping designed to conserve resources required to maintain the landscapes. This is accomplished by selecting drought-resistant plants, designing water-efficient irrigation systems and using mulch to reduce evaporation. 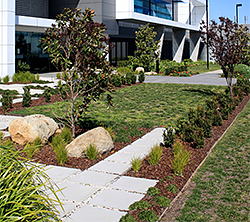 Xeriscapes reduce costs associated with water usage and labor needed for maintenance. California Creations designs and installs xeriscapes for customers throughout San Fernando Valley, Santa Clarita Valley, Simi Valley and surrounding areas. Though it is possible to incorporate Xeriscapes into existing landscapes, it is best to have them designed from scratch. This significantly reduces the overall amount of resources required for maintenance. California Creations performs these projects from start to finish. 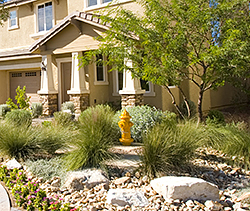 We select appropriate drought-tolerant plants and we design and install water-efficient irrigations system. We create a perfect balance of resource reduction and aesthetics. Grouping - We group the plants based on their watering requirements. This enables us to design irrigation systems that deliver accurate amounts of water to each plant without wasting water by overwatering or damaging plants by underwatering. Xeriscaping is truly a “Green Landscaping” option which can be incorporated into any type of property- residential or commercial. 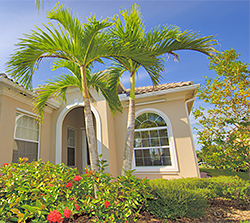 We can provide you with the most unique landscaping designs and it is a very modern take on landscaping. It adds to the curb appeal of your property and looks and feels very fresh despite the fact that it uses very little water. Regardless of the region you live in, xeriscapes are an ideal option for turf and other plantings. If you feel want to know about the different xeriscapes solutions that we can provide, contact California Creations on 818-083-1213.